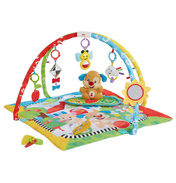 Play Gyms are the perfect piece of equipment for your new baby to use before they start moving around. 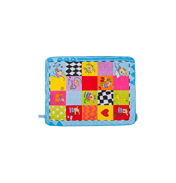 They are safe, soft and easily portable, so you can move them upstairs for your baby to lie on while you do a little tidying or use them to entertain your little one while you are having a relaxing few minutes with a cup of coffee in front of the TV! 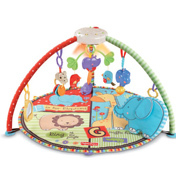 Most of the playmats and gyms come with an arch with toys attached which becomes a great interactive toy for your baby to use to develop their motor skills, hand eye co-ordination and a sense of exploration from the word go, as they reach up to the toys above they start to gain control of their arms and hands aiming towards what they’re looking at. 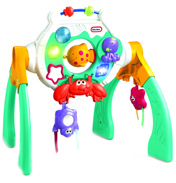 You could also attach some of your babies other favourite small toys so that they do not become bored playing with the same toys over and over. 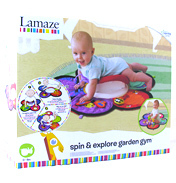 They can begin to use all the senses to explore the mat or gym. 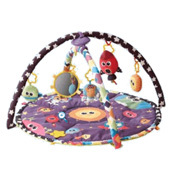 This could be their first step towards their knowledge and understanding of the world around them. 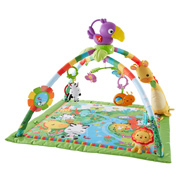 On this shelf there are many different types of gyms and mats, including the Lamaze ones that are designed specifically for baby to be placed on their tummy and ‘practice’ tummy time. 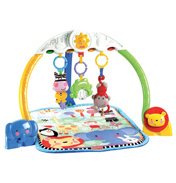 Also the very popular Fisher Price Rainforest Play Gyms with their bright colours and fun characters. 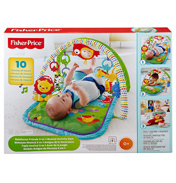 You may be tempted to have a lie down and join in with the fun!